Posted by Garibaldy in Blogging, Capitalism. Guido Fawkes is reporting that it did, and that he has documentation to prove it. Posted by Tomboktu in Blogging, Bunreacht na hÉireann, Ethics, Internet. I am glad to see Fine Gael catching up with the blogosphere. 1. Amendment of Article 35 of the Constitution. “6 The remuneration of a judge may be reduced during her or his continuance in office only when and to the same extent that a reduction in pay is applied to a significant proportion of workers who remuneration is supplied from public funds.”. 2–(1) The amendment of the Constitution effected by this Act shall be called the Twenty-seventh Amendment of the Constitution. (2) This Act may be cited as the Twenty-seventh Amendment of the Constitution (Putting Manners on the Judiciary) Act, 2009. The Bill is designed to amend the Constitution in order to achieve the following purpose: To make it constitutional for the pay of members of the judiciary to be reduced provided that this is done in a way and at a time that is similar to any reduction that applies to other public sector workers. Posted by WorldbyStorm in Blogging, CLR empirebuilding. I think I know how it got there and it’s good to see. Gramsci would be pleased. Maybe. Posted by WorldbyStorm in Blogging, Culture, Irish Politics. 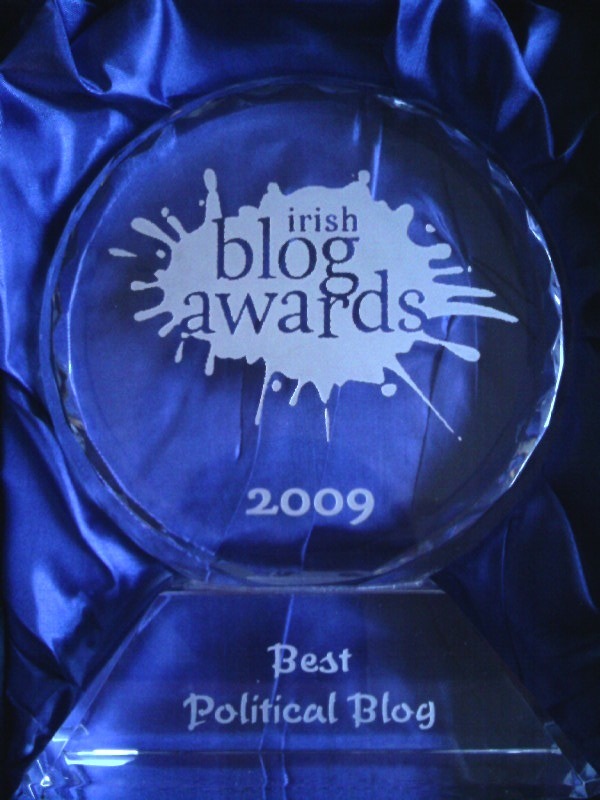 Just to say a word of thanks to Damien Mulley who handed over the award for the Best Irish Political Blog 2009 to me earlier this week in a central Dublin hotel. Unfortunately the CLR wasn’t able to send one of its nationwide network of contributors and commentors on the day but it was very good of Damien to drop by. Here it is (Fact: this is the very first award I’ve ever had even a part share in so trust me, you all get to see the photo!). Once again, many thanks to those involved in this process. It’s genuinely heartening to get this award and it is built on the work of all of those who have contributed, commented and visited the Cedar Lounge Revolution. Posted by WorldbyStorm in Blogging, Culture, Uncategorized. Posted by WorldbyStorm in Blogging. Posted by WorldbyStorm in Blogging, Irish Politics. There is a problem with the nature of the internet, particularly the unpleasantly named Web 2.0. For those who have use or have access to sites there is the opportunity to use them as and when the mood strikes. Which is unbelievably dangerous because it engenders a sense of importance, which can be illusory, and immediacy, which is very poison. I’d echo entirely Conor’s words on Dublin Opinion about the recent problems over at Politics.ie, not because I’m a wimpish blogger, or middle-class bottling it in the face of power, but simply because they are right. P.ie has become a bear pit in regard to all things Ahern and Tribunal. Words were allegedly put in the public domain that have now impelled a legal company into action with charges of defamation. The possibility of such words being written was obvious, the response inevitable. And that David Cochrane has been, to some extent, caught in the crossfire is unfortunate. But this is the real world where chances are a legal firm will be first to up the ante – particularly if they think that it is themselves who have been impugned. To read this then as some sort of attack on Politics.ie with the motive of ‘chilling’ conversation on the topic of the Tribunals or Ahern is nonsense. To see that then as the rationale for a broader campaign to defend ‘free speech’ is near-risible. To then, as some (assiduously hunting with the hounds and running with the hare) suggest conspiracy – or rather air the idea that some are saying it is only to dismiss it while simultaneously spreading it yet further is … well, it is what it is. In a situation like this there is one solution. The problem is dealt with as it by separate legal teams, because that’s the only way it can be dealt with. No public campaign on the internet is going to change this issue. No appeal to a gallery that will melt away at the first hint that this will incur either financial or other penalties. No dubious relocations whose efficacy has yet to be proven in Irish law. It requires first and foremost cool heads, restraint, and the sort of compromise that is one aspect of the nature of the legal system. Particularly when what we’re talking about are commercial entities. I support Dave Cochrane. I don’t support those who persist in putting his site and personal finances in jeopardy especially those mouthing off when service of legal action may be imminent. 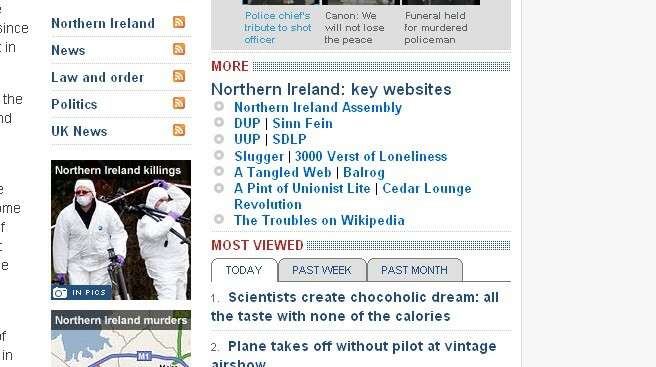 News has come to us of a well deserved win for Irish Election as best political blog. 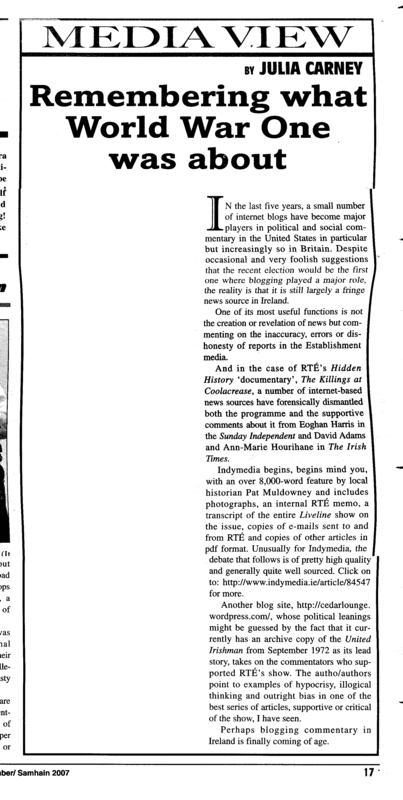 For myself I found it absolutely invaluable during the election (albeit on the day of the count I wound up in the Teachers Club on Parnell Square multitasking by drinking pints, periodically checking out the news from next door where Cián and Simon had established a ground control for Irish political blogging and keeping a weather eye on the RTÉ coverage! The death of the Left, indeed.). And it’s also worth noting their generosity in providing a platform for many other bloggers to put up material, something which has sustained it through the pre and post-election period. One other point. That they have a somewhat divergent political direction in terms of their identifications on the political spectrum has been no harm at all. Anyhow, I have almost no other news from the Awards which neither I nor my comrades from here attended due to our paranoid and excessive need to keep our identities secret! I’m kidding. But from what reports are filtering through it sounded pretty good. Posted by WorldbyStorm in Blogging, Class, Social Policy. Posted by WorldbyStorm in Blogging, Irish History, Media and Journalism, Sinn Féin. Frankly it’s a glowing tribute, and much appreciated, although whether we’re anywhere near that good (or even adequate) is a different matter. Personally I don’t think blogs can achieve the sort of critical mass that they do in the US. The US has – to my mind – a very mature and engaged political system at certain levels. There is remarkable interaction and engagement by those who are politicised. And this, I think, is perhaps partially because elections are much more a part of US general life, in terms of electoral contests for municipal and other organisations than they are in this society, or indeed the one next door. That can lead to oddities, as we’ve seen on numerous occasions, and the system does become slanted towards those with money, as distinct from those without. But, the principle is a good one, and one that could be adopted more widely. Anyhow, I’m continually reminded of this when I listen to the various NPR shows on the internet (incidentally, talking as Conor was about dumbing down the media… people can keep (most) of the BBC, although not all). We complain here about a tilt towards the right in our society but listen to ‘Left, Right and Centre’ or ‘To the point’ and the range of ideological positions is quite remarkable and makes our own media seem very tame. Now, I’m not suggesting for a moment that what is true of NPR is true of the entirety of U.S. society, but it is reflective of a serious strain of political thinking that crosses partisan lines and I like that – a lot. And to return to my central point, this leads to a politically engaged spectrum which consumes a range of information from various sources, some of remarkable quality. And that means that bloggers have a much greater penetration into that system (it’s very noticeable to me how many people on the NPR shows have their own blogs – mind you they probably have their own myspace pages as well…natch!). At the Irish Election Bloggers Conference last Autumn Guido Fawkes was the main speaker (incidentally, good to see the IE redesign which is clean, crisp and logical. Fair dues to Simon and Cian and designer/coder John Blackbourne). He seemed to be pushing a very proactive line, a sort of Private Eye on internet steroids. That’s fine as far as it goes, but in a smaller, more personal polity like the one(s) on this island it is more difficult. To ‘break’ news, or even to cross a certain line and ‘create’ news is near impossible, and almost certainly impossible to do on a daily or weekly basis. But reflecting on a discourse, now that’s a different matter. And I think that’s pretty good in itself. Still, that leads me to another thought. We’ve already sent out a call for further material to the Left Archive. More would be appreciated, particularly material from the smaller groups that haven’t been represented yet (yes! I want that SWM leaflet I handed good money over in ’88 and promptly lost). But it would also be interesting to hear if you have any ideas for the Cedar Lounge Revolution. What do you like or dislike? Any thoughts on improvements? Stuff you want to see?